Provide comfort for the family of Lucy St Pierre with a meaningful gesture of sympathy. 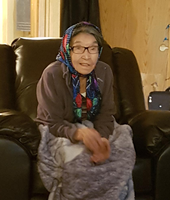 It is with great sadness that we announce the passing of Lucy St Pierre of Wollaston Lake, SK on February 25, 2019, at the age of 84. Lucy was born in Northern, SK to Jean ShaOulle and Helen Joseyounen on February 26, 1934. She is survived by her children: Monique Besskkaystare, Ernest (Sophie) Tsannie, Therese (Bart) Tsannie, Helen (George) Josie, Annie (Solomon) Joseyounen, George (Caroline) St. Pierre, Celine (Nap) Besskkaystare, Jermone (Shirley) St Pierre and Louise St Pierre; her daughter-in-law: Georgina St Pierre; her step-daughters: Flora (Johnny) Moise and Marie Hansen; her grandchildren: Jimmy, Stella, Cheryl, Georgie, Joey, Geoffrey, Sherrideen, Alex, Abraham, George, Annette, Darell, Jeffery, Cherylyn, MIranda, Charlene, Charnell, Michell, Pason, Celina, Anita, Bradley, Colleena, Katelyn, Brandon, Cheryl, Shelly, Shatell, Shanllee, Jerome Jr, River, Shelleen, Kyle, Eric, Arnold, Andy and Corey; her siblings: Andrew, Modeste and Thomas (Dora); her niece: Evelyn Dzellion; her special friend: Jenny Joseyounen; her 67 great-grandchildren and 1 great-great grandchild. She was predeceased by her husband: Gabriel St Pierre; her parents: Jean Marie ShaOulle and Helen Joseyounen; her step-father: Anton St Pierre; her brothers: Alphonse ShaOulle and Albert ShaOulle; her sister: Cecile Dzeylion; her brothers-in-law: Antoine Dzeylion, Pierre St Pierre and Modeste St Pierre; her son: Joseph St Pierre; her grandson: Carl St Pierre; and her son-in-law: William Hansen. A Wake Service will be held on February 26th to the 28th at the residence of Helen and George Josie, located in Wollaston Lake, SK. A funeral service will be held in Lucy's honor on Thursday, February 28th, 2019 at 11:00 am at St. Adrian Roman Catholic Church, Wollaston Lake, SK, with the burial to follow at Wollaston Lake Cemetery, Wollaston Lake, SK. Arrangements in care of MacKenzie Chapel & Crematorium Brian and Bev Stobbs, Renée Phaneuf - Funeral Directors. www.MacKenzieChapel.ca 306.763.8488. To send flowers in memory of Lucy St Pierre, please visit our Heartfelt Sympathies Store.